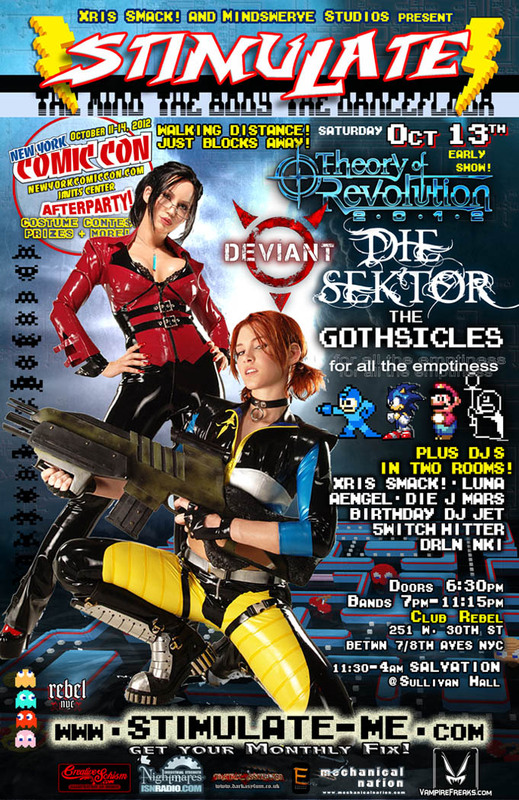 10/13/12 – STIMULATE presents the Theory of Revolution Tour w/Die Sektor, Deviant UK, Gothsicles, for all the emptiness & NY ComicCon afterparty! STIMULATE presents the Theory of Revolution Tour w/Die Sektor, Deviant UK, Gothsicles, for all the emptiness & NY ComicCon afterparty! followed by SALVATION @ Sullivan Hall 11:30-4am. Prepare yourself for the Revolution! Originally formed as a duo by Gant and Denman in 2002, DIE SEKTOR were quickly signed to leading German harsh-EBM label NoiTekk following the self-release of their 5-track demo “Scraping The Flesh” in 2004. The acclaimed debut album “To Be Fed Upon”, mastered by Kolja Trelle (SOMAN), was released by NoiTekk in 2006 – and later by Russian label Gravitator in 2007. Subsequently DIE SEKTOR have remixed several high-profile artists in the electro-industrial scene including DAWN OF ASHES, GRENDEL, and most recently ALIEN VAMPIRES (DWA/Alfa Matrix), CEDIGEST (DWA/NoiTekk) and DETROIT DIESEL (DWA/Infacted). SINCE MATERIALISING IN 2004, Jay Smith's Deviant UK has established itself as a force to be reckoned with on the European Dark Alternative scene. The long-awaited debut album 'Barbed Wire Star' was released in September 2006, spawning the anthemic club hits 'Raptured Saints' and 'Access Denied!'. Their unique sound is powerful, distinctive and instantly accessible. This band is defined onstage - perpetually on tour, they have taken in the length and breadth of the UK, Mainland Europe and much of the USA. In recent years, Chicago's ultrasweaty industrial dance dorkstorm, THE GOTHSICLES, have played some of the most talked about live shows at some of the most premiere industrial music festivals around the globe. Compounding a ruinous mix of crass humor, video games and geek culture with an unapologetic EBM affinity, The Gothsicles' 2011 release "Industrialites & Magic" (WTII Records) reached the #1 spot on Amazon.com for "Most Downloaded" in the "Goth & Industrial" category. :Deviant UK, Die Sektor, EBM, for All The Emptiness, Insutrial, STIMULATE, THE GOTHSICLES, Theory of Revolution, Xris SMack!